Ministry of Propaganda - 13/Jul/2005: "Fighting the Heat"
All loose paper moved away? Check. All newspaper and magazines closed and weighted down? Check. All lightweight objects secured? Check. All windows and doors open? Check. Power plugged in and switched on? Check. OK, let's go. Straight to hurricane setting, let's see if we can blow the heat out of my flat. 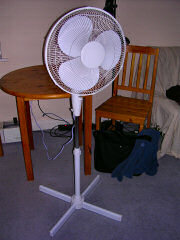 Others only have these lame Ersatz fans, I have decided to invest into some proper industrial strength fans. My initial plan was to buy a fan at Tesco while doing my gocery shopping (might as well collect some Clubcard points for it). But alas, fans were out at Tesco. What to do? Suffer in the heat again? No, not really an option. I remembered that there was a Wickes just down the road. With five minutes to spare before they closed I arrived and yes, they did have fans. I picked up a pedestal fan and went to the checkout. Standing in the queue I thought, what the heck, went back and added a desk fan. 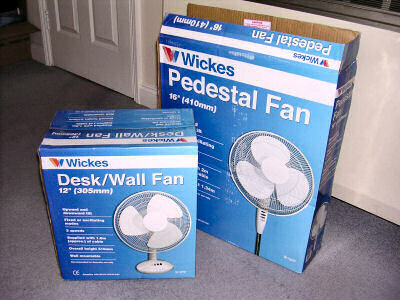 Meaning I'm now the proud owner of two fans. The pedestal fan is standing in my living room, making it bearable here. The desk fan is not standing on a desk but the chest of drawers in my bedroom, hopefully helping to make the room cool enough to sleep soon. That's all, enough hot air for today.